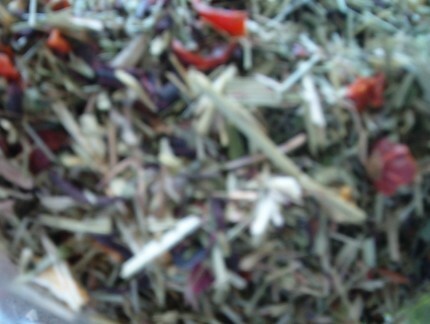 A pleasantly fruity and minty blend of herbal ingredients. Delicious and caffeine-free! This tea presents a challenge to me, because I’m not really crazy about it. It’s not necessarily a bad tea though – it’s just not my favorite tea. Let’s start with the obvious (as far as my palate is concerned). This blend has a lot of hibiscus in it. Hibiscus is not my favorite herb in teas because it offers a very tart flavor and has a rather thick body, so if there is a lot of hibiscus in an herbal blend, it can brew up to be rather thick and somewhat syrupy. I know that there are a lot of people out there who love hibiscus. I’m just not one of them. That’s not to say that I don’t enjoy some blends with hibiscus in them, but, I am just of the opinion that it needs to be added lightly. Too much hibiscus is well… just too much. And for me, this blend has a little too much, and it interferes a little bit with the other flavors. I can taste the fruit flavors of lemon and orange – and these flavors are quite pleasant, and I think they would be even better if there were less hibiscus in this blend. The hibiscus tends to highlight the sour qualities of the citrus fruits, and much of the subtle sweetness seems lost. My favorite part of this tea is the peppermint. I really do like how it seems to be peeking out of the other herbs in this blend. It’s like a little tease of peppermint, and it does entice me to keep drinking, if for no other reason than that little hint of peppermint. This makes a much better iced tea than a hot tea, and I do recommend a drizzle of honey or agave nectar or some sugar to help curb some of the tartness of this unless you really like tart. As I said at the start, this is not a bad tea, it is just not my favorite tea. I know that my palate tends to be overly sensitive when it comes to sour/tart flavors. So, I do encourage you to try it for yourself… and if you like it, please stop by and let us know – I’d love to hear from you!